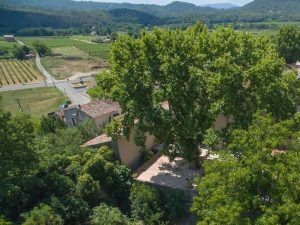 View south over the house towards Le Val and Brignoles. The hills and vines. Taken using DJI Phantom 3 Professional. 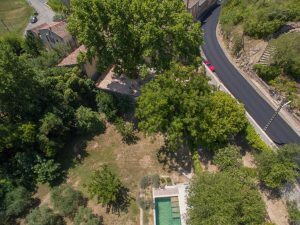 View of the Route de Brignoles and Maison Lambot’s Plane trees and swimming pool. As you can see the pool gets a lot of sun. 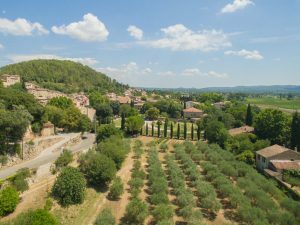 Olive Oil Production – 17 Years ago, when they purchased the property, our family planted an olive grove in the fertile grounds of Maison Lambot. Today the olive trees have matured and produced great harvests in 2015 and 2016. This shot shows the olive looking towards the village of Montfort. The Chateau de Montfort is on the left of the frame.